This is a rare still life amongst Richter’s works; he seems to have been drawn to paintings of figures in various settings, from Burra-esqe sailors in bars to musicians in bands and orchestra, and even to jockeys. 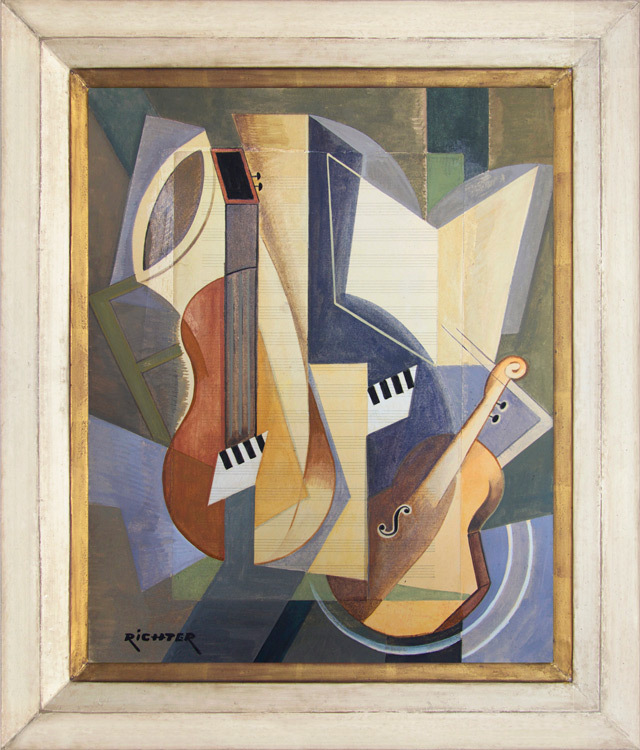 This particular painting relates to his musicians, in which the forms of violins, saxophones, pianos and banjos are used to articulate the surface geometry and decorative patterning of the work. Richter has followed Picasso and Braque not only in his cubist composition, but in his use of collage. A sheet of unused music paper has been pasted onto the canvas, the empty staves disappearing into and re-emerging from the painted areas, and creating sheet music from the unpainted parts. A violin, saxophone, classical guitar and part of a keyboard combine with a music stand and the untidy sheets of music to suggest the paraphernalia of a contemporary jazz band. The harmony of earthy browns, greys and greens is lifted by the golden tones of the saxophone and sheet music into a playful tribute to modern jazz. Aurel Richter was born in Budapest in June 1870, a Jewish-Hungarian who may be related to the painter and engraver Anton Philipp Richter, portraitist to the 19th century ruling class of Hungary. Aurel Richter studied under Karl Lotz (1834-1904), who worked mainly in Vienna, decorating the interiors of palaces and public buildings with frescoes; Lotz was a member of the Viennese Academie. Richter lived and worked all his life in Budapest as an illustrator, painter and designer; although he seems to have been protected by family circumstances from a need to earn his living from his art. However, he was not insulated from European art movements. He was in touch with painters of the German avant-garde, and in particular with members of the Bauhaus in Weimar. Here, in about 1920, he met Oscar Schlemmer, who became a close friend in spite of the difference in their ages (Richter was 18 years older). Schlemmer’s figure paintings, with their stylized, rounded forms, have a certain similarity to elements in Richter’s work, but their subjects are generally more domestic. Richter painted lovers, sailors, classical and jazz musicians, and such contemporary subjects as biplanes aand cyclists; his work – although always figurative – shows the influence of Cubism and Fauvism.